This dish is ideal for busy weeknights when you want to come home to a hot meal! Simply prep everything in the morning, and set your slow cooker on low for 8–10 hours. 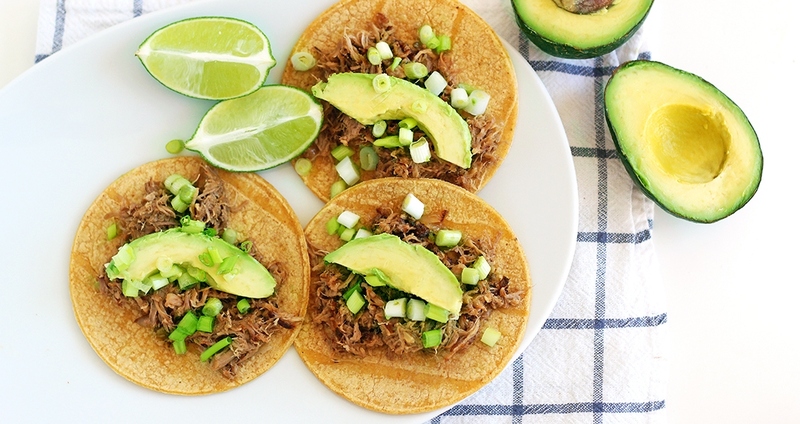 These carnitas are perfect with corn tortillas and topped with avocado and green onions. Feel free to add your other favorite toppings like guacamole, pickled onions, jalapeño slices, sour cream or salsa. Add one tablespoon of coconut oil to a large skillet over medium-high heat. Add the pork and sear on each side for 1–2 minutes, until browned. Transfer pork to a slow cooker. Add the onion, garlic, cumin, oregano, bay leaves, salt, lime juice and orange juice. Cover and cook on low for 8–10 hours (or on high for 4–5 hours), until the pork is completely tender and shreds easily. Remove the meat from the slow cooker (reserving the juices) and shred with a fork. Add the remaining tablespoon of coconut oil to a large skillet over high heat. Add the pork and sear until browned and just beginning to crisp. Add the juices and continue cooking until the liquid reduces. Serve the carnitas warm with the corn tortillas, avocado slices, green onions, and black pepper to taste.